Draw.io is an online image editor that provides its user fast, easy and free way to create simple diagrams without the need to install anything on their computer. Everything that Draw.io offers can be quickly accessed via your web browser. Editor that welcomes you as soon as you enter Diagramly’s website will enable you to immediately start drawing your diagrams, no matter if you are novice of professional. Every object that can be found in the sidebar of Draw.io can be dragged and dropped to the work surface, and then modified to better suit your purposes. Online diagram drawing app! Everything that you will need to create diagram is present here – from simple drawing tools, advanced shapes, vector graphic icons, to the professional looking clip art images from various fields of design (computers, people, finance, etc.). 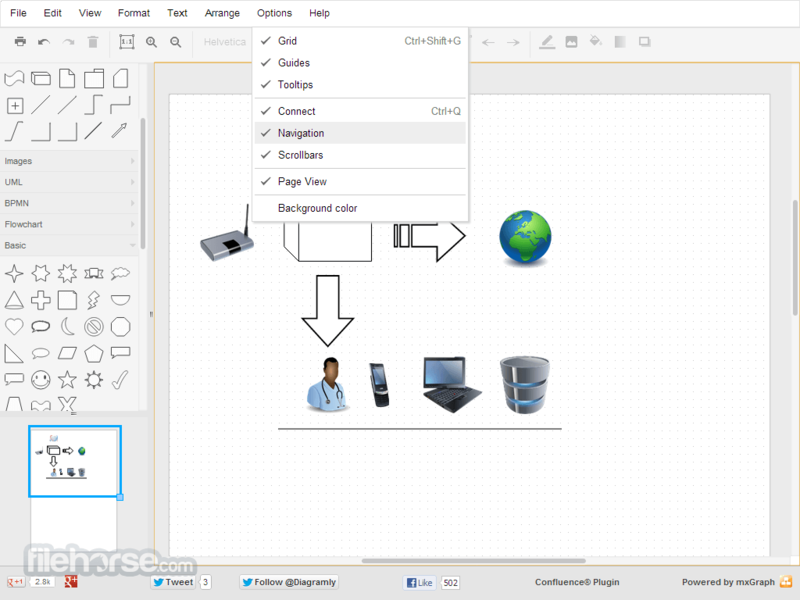 If you want practical and easy way to create diagrams straight from your browser window, then go straight fo Diagramly and start drawing! Creating diagrams online is something that can today be done with many easy to use services, although whenever you hear about some popular service that has managed to attract millions of users and large businesses you find out that its free tier of use is severely limited and can offer you just basic functionalities that you can rarely use effectively. To combat this, open source community and talented developers offered highly competitive alternatives, which are in many cases equaling or even surpassing the solutions offered by services that are asking form their users incredible amount of money on monthly subscriptions. 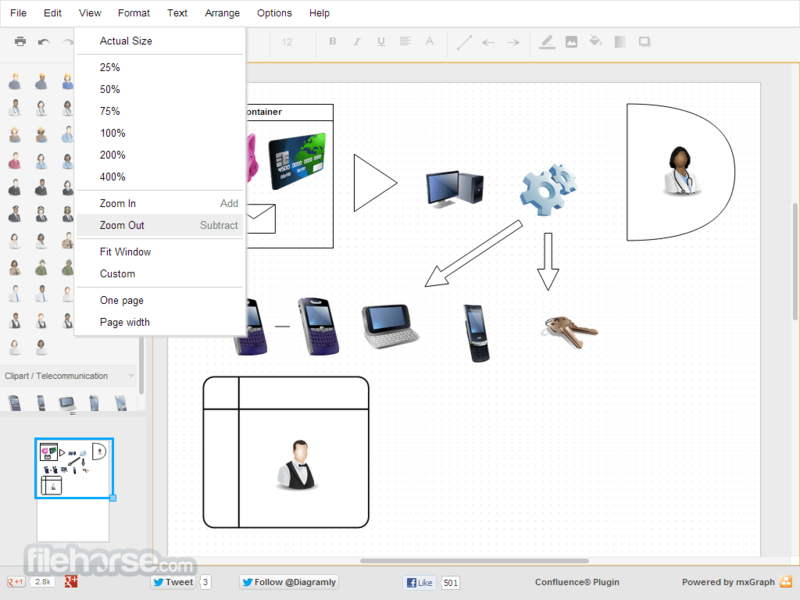 One of such tools is Draw.io, a 100% free diagram creator that takes its cues from the most popular tools but manages to offer its complete functionality in a package that can be used by anyone without any limitation, restriction or asking for money. Draw.io is a very functional and capable online editor that enables everyone who has HTML5 compatible browser to very easily create diagrams of countless shapes and sizes, and save your results for 100% free on your Google Drive online storage, Dropbox and local storage. Online diagram drawing app! While many similar cloud-powered web applications demand from user to create new account and then start working on a complicated procedures to manage your entire pipeline of diagram creation, here users are presented with a incredibly streamlined interface which excellently success in being accommodating, helpful and out of the user’s way. Process of creation of your first diagram can be started just mere seconds after landing in the Draw.io main page, with the editor already be present there and ready to be used as soon as your tell it where do you want to save your diagrams. New diagram can be crafted from a blank canvas, or by loading up one of the more than fifty templates that are separated into twelve categories – Basic, Charts, Business Process, Engineering, Flowcharts, Mind maps, Mockups, Network diagram, Software design, Vienn diagram, Wireframes and Others. 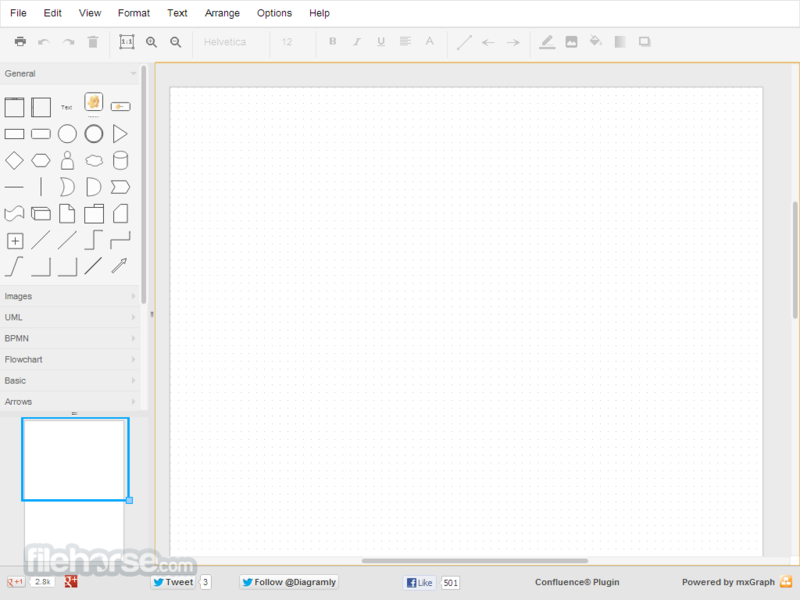 The main editor itself is very well organized, with large toolbar section on the left side of the work area, where you can very easily drag and drop items that are placed into very large object library that covers 20 separate categories such as General, Images, Entity Relations, iOS, Android, Flowchart, Arrows, ClipArt’s, Signs, Floorplans, Electrical and many others. Draw.io is a service that is seriously committed to not waste time of users, immediately placing them into the dashboard of the very highly capable diagram editor that can be used by both novices and professionals to create highly attractive, detailed and easy to manage diagrams for any usage scenario. It’s important to notice that diagrams created with this app can b embedded into any HTML website or blog, downloaded as PNG, GIF, JPG, PDF, SVG, PNG, HTML or XML, and finally it can be eve printed. Draw.io is 100% free for use, without the ability to manage your account. Simply use it how much you want without restrictions. If you want to create diagrams online from inside your browser, look no further than Draw.io, free web application that has proven itself to be incredible alterative among competition of all premium diagram management apps you can find online today. Amazing Online diagram drawing app!